The California Milk Processor Board (CMPB), creators of the iconic got milk? campaign and its Spanish-language counterpart Toma Leche, are making the holiday season bright with fun family activities, milk and snacks and the popular El Chavo characters dressed as Los Tres Reyes at retail locations across California beginning Dec. 8 through Dec. 21 and from Jan. 4 to Día de Los Reyes ("Kings Day") on Jan. 6. At participating retail locations, grocery shoppers preparing for the holidays will be able to enjoy a quick snack paired with milk at Toma Leche sampling stations, and partake in celebratory holiday activities including arts and crafts and a Rosca Spin Wheel for a chance to win prizes including Toma Leche and El Chavo tote bags, notebooks and more. The Children's Lane Christmas Parade at South Gate Park, 4941 Tweedy Blvd. Dec. 10 from 12 p.m.-5 p.m.
Vallarta Supermarket, 1951 W. Clinton Ave., Fresno, Dec. 15 from 12 p.m.-4 p.m.
Vallarta Supermarket, 3425 Whittier Blvd., Los Angeles, Dec. 22 from 12 p.m.-4 p.m.
Superior, 7300 Atlantic Ave, Cudahy, Jan. 5, from 12 p.m.-4 p.m.
El Super, 4421 University Ave., San Diego, Jan. 6 from 12 p.m.- 4 p.m., which will feature a special milk plus rosca de reyes pairing in honor of the Día de Los Reyes holiday. "The holidays are a special time that connect family and friends through our cultural traditions, meals and celebrations," Steve James, executive director, California Milk Processor Board, said. "And whether it's at the center of the holiday table or paired with a delicious snack, the holidays are always better with milk." Additionally, customers at more than 120 Vallarta Supermarkets, El Super, Northgate, Arteaga's and La Preciosa retail locations throughout California, including Los Angeles, Bakersfield, Fresno, San Diego, San Francisco, Salinas and Sacramento, will be treated to a holiday snack paired with a glass of milk while they shop for holiday meal essentials. 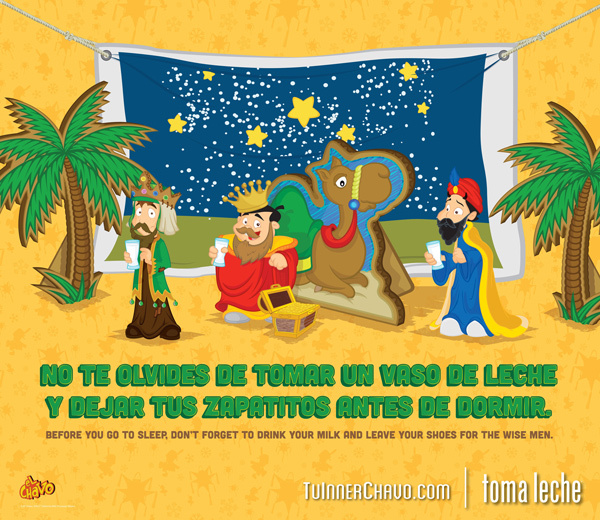 Those who purchase milk in-store will receive a free El Chavo/Toma Leche branded lunchbox as their gift with purchase. The most-watched show on Mexican television, El Chavo was known as a courageous kid in and out of trouble, who entertained generations of fans across Latin America. Millions of viewers who have embraced the character for his wholesome, pure authenticity and innocence still watch the animated version and reruns in Latin America and on Spanish-language networks in the United States. For a complete list of events, dates and participating retailers across California, visit tomaleche.com and tuinnerchavo.com., follow Toma Leche via social media on Facebook, Twitter and Instagram @tomaleche.